Home > Solar Inverters > Microinverters Vs. Dc Optimisers: Which option is best? Microinverters Vs. Dc Optimisers: Which option is best? If you’ve decided on panel-level optimisation, which is the better choice, microinverters or optimisers? Good grief this article is going to get me into trouble with some solar installers. Why? Because by the end of it I will give my humble opinion on whether microinverters (e.g. Enphase) are better than DC optimisers (e.g. SolarEdge or Tigo). Please let me be very clear. This article is not saying microinverters or DC optimisers are a better choice than a standard central string inverter. That totally depends on your situation. If you have an unshaded roof, facing one or two directions then a conventional string inverter system is a very compelling choice. However, if you have a multi-faceted roof and or shading issues, then individual panel optimisation is almost essential. Your choice then becomes whether you achieve this with micro-inverter or DC optimiser technology. But first – let’s get back to basics and explain the jargon I’ve just hit you with! The traditional and most commonly used method is to use a single (string) inverter. On the upside it’s low cost, there’s a huge variety of products available and the technology is well understood. Power is distributed at high voltage DC (typically 200-500VDC) to the inverter where it is converted to 240V AC. On the downside, because all the solar panels are connected together in series, individual panel outputs are not optimised. If shading, soiling or different temperatures occur the entire output can be dramatically reduced or even stopped. This is where “panel level” optimisation can help. There are two primary methods used to achieve this that we will explore today– power optimizers (also called DC optimisers) and micro-inverters. The panel optimizer is attached to the solar panel and thus gets the benefits of panel level optimization under a wider variety of conditions. Different manufacturers each claim different advantages and some partner with panel manufacturers to factory fit them. The power generated is transmitted at high voltage DC (typically 200-500VDC) and the inverter, typically wall mounted, does the DC to AC conversion. Therefore you get the benefits of panel level optimisation and the cost savings of using a single string inverter. The power generated is transmitted at 240V AC from each micro-inverter and connected in parallel, then connected in directly to your switch board. Different manufacturers each claim different advantages and have a few minor twists on the theme, but the principle of operation remains the same. We have taken a look at the key issues that differentiate micro-inverters against optimizers and listed them below for you. In all cases, we are comparing to the better/high quality products because in our view, low end inverters, no matter what type, are a nightmare to be avoided! As a general rule string inverters are typically marginally higher in efficiency. However, your overall system efficiency (yield) should be slightly higher with optimizers or microinverters because they optimise individual panel output. The difference in claimed efficiencies between optimizers and micro inverters is so little, it’s barely worth considering. Optimizers require a single inverter to be installed and DC cabling d protection equipment on the roof. Micro inverters do not and instead, use plug and play connectors to install so from what I hear they are faster. However, if your module already has an optimizer fitted then you are installing single inverter only plus the cabling, this option would be marginally faster. Theoretically, the efficiency of DC or AC transmission from the roof should be about the same, assuming standards are followed. 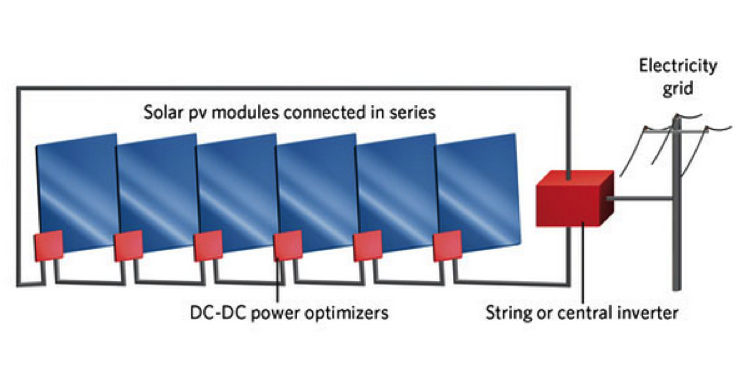 Because optimizers need to be designed to match the “maximum panels per string” on string inverters, the design parts takes a little extra time. I also note that not all inverters work with all optimizers, so you need to get some product familiarity training, although there are some neat tools to help you. Micro inverters on the other hand only need to match the power output of the panel and then are only limited by the capacity of what they call “AC branches”, or to the layman, the power limit of the AC cable and plug system. In most residential applications you won’t hit this limit. Additionally, if you want to add more panels later, a micro inverter system can easily accommodate this as long as you don’t reach the AC Branch limits, and you can add them one at a time if needed. Optimizers need to be matched to the string inverter limits, so that’s a harder boundary. When you consider larger, commercial installations the theory is that optimizers have two advantages. Firstly, you can go to larger string inverters which get cheaper as they get bigger. Secondly, three phase or “double optimisers” which can take inputs from two panels offer further scalability benefits. Putting aside the design and installation complexity (compared to micros) I think optimizers may offer a very slight advantage in terms of capital cost due to scalability. Batteries charge and discharge DC electricity. So batteries should be cheaper and easier to integrate with Optimisers, because they keep the DC wiring all the way down to the central inverter. Certainly the Tesla Powerwall is designed to integrate out-of-the box with Power Optimiser company Solar Edge’s inverters. An microinverter system runs on AC, so battery integration is always going to need an extra battery inverter to “AC couple” it into the system. This will make battery integration more expensive with microinverter systems if you are buying your solar and batteries together. If you are planning on retrofitting batteries later, then you’ll need to buy a battery inverter anyway, so it should be no more expensive to retrofit batteries to microinverters or DC optimisers. This is a tricky one. On the one hand the logic of having fewer parts on the roof (just the optimizer and not the inverter electronics) is pretty sound. Intuitively, this would suggest a higher probability of reliability to optimizers. However, with the benefit of hindsight in the market I don’t see evidence of any major differences in failure rates (excluding crappy micro inverters). What we also see from the top micro inverter guys is very high volume manufacturing and intense attention to automotive level quality assurance. It’s also the case that in a micro based system, if one unit fails, the rest of the system keeps on working because there is no single point of failure. In an optimizer based system, if the (single) string inverter fails, the whole system shuts down and in some cases if a single optimizer fails the string goes down too. Having said that, replacing a single inverter in the garage is easier than climbing on the roof. Theoretically optimizers should be better, but compared to top end micros and overall, I don’t see it, especially when redundancy benefits are factored in. Optimizers have two potential points of failure– the optimizer and the inverter- compared to micros single point and I think that separates them for me. Another factor to consider is the reliability of the solar panels that the inverter or optimiser is attached to. Potential Induced Degradation (PID) is a failure mode of solar panels that is caused by high voltages across the panel and may not show up for 5-20 years after installation. Microinverters keep the panels at a much lower DC voltage than optimisers and so the theory is that this will reduce the chance of PID in the panels. PID is one of the more common causes solar panels failing in the medium to long term. Around the world the risks of High Voltage DC continue to be debated. When everything is done perfectly, great gear is used and maintenance is regularly conducted, HV DC is just fine and very efficient. However, the reality is that often isn’t the case and so rooftop safety is a growing issue. HV DC and 240V AC both present electrocution risks, but HV DC is more prone to creating fires when it all turns bad. The major optimizer manufacturers almost all talk about their roof mounted units being able to recognise fault conditions and having the capability to isolate individual panels in the case of a fault so even though the HV DC cabling is still present they seem to have that in hand. What I don’t like is that you still need DC isolators which are the number one cause or problems in Australian solar systems. I also note that some optimizers require an optional device to enable this functionality in some circumstances, leaving room for error. Micro inverters don’t let the DC out; it’s converted immediately to 240AC. Generally speaking it’s also true that electricians are more familiar with AC. Theoretically based on of all of the above, the risk is slightly lower with micros I think. The general market price of an optimizer system (including the inverter and DC protection gear) is lower than most micro based systems although the gap is closing rapidly. So ignoring everything else, optimizers win today. However, I don’t think that tells the whole story when it come to the end customer because they want reliability, performance, adaptability and the lowest cost of ownership, although they might not say that. They don’t want hassles and prefer flexibility. The installation cost was a draw but there’s arguably a bit more design and specification time required with optimizers. Flexibility went to micros but scalability to optimizers so let’s call that quid pro quo. Lastly you have to factor in reliability and safety issues, which was a close call but I think went to micros. So on raw price, a Win to optimizers. On lifetime, overall price, a Win to Micros. Based on this assessment and our reviews of as many other assessments we could find, I don’t think the jury is out on whether optimizers or micros offer distinct advantages over each other. They each show some benefits and advantages but on balance they almost match each other. It therefore becomes a subjective matter so I’ll just give my opinion and leave you to make up your own mind too. I think lifetime cost, flexibility and simplicity make sense so I would give it to micros. But if a DC coupled battery was on my wish list, that would tip the balance to optimisers due to the cheap integration. What about you? Let rip in the comments. I’ve recently changed my mind on this. Most people have a relatively simple roof (panels will face 1 or 2 directions). They also often have one or two shade objects such as stink pipes, aerials or chimneys. The most cost effective option in these situations is a string inverter with Tigo optimisers only on the shade-affected panels. This way you get the cost benefits of the string inverter and the optimisation on only the panels that need it at an extra cost of only about $100 per optimised panel. If microinverters ever get as cheap as string inverters (as Enphase have been promising for a while now) then I would recommend microinverters. But at the moment they are still add about 20% to the system price. I have two new smart meters and they would not connect me for feedin until I consolidated them to one meter. I could not get any sense from the power company so I went to the ombudsman who gave it a lot of time. In the end, they said it has to be a net feedin calculation and requires one meter. In this day and age we can’t add two together. Has anyone else had this problem? I’ve just spent four days and several hundred dollars bringing up to scratch a relatively low-mileage car (Ford), including valves/tappets, timing, carby-kit, etc. (all the ‘normal’ ~ periodic ~ stuff), and then still had to take it down for a dyno-tune/exhaust-analysis. …..and it wasn’t even up on a wet and blowy roof! Fiat: Fix It Again, Tony. Lotus: Lots Of Trouble, Usually Serious. Hand On Little D*ck Every Night. The still-perfectly-operating replacement took me about TWO MINUTES to install. My only gripe is that ~ despite several requests ~ none of the whizkids here and elsewhere have come up with a way of circumventing the ‘anti-islanding’ loop so that it can be used in a stand-alone situation. It performs ALL the tasks the pricey alternatives do, and ~ according to the published figures ~ does so significantly more efficiently. AND I already own it. Thanks for the timely and interesting article mate! I have been researching this for some time, and in fact, the desire to integrate storage has delayed me installing any solar up to this point. Though given Elon Musk’s announcement about Powerwall and the continued reduction in costs of systems now, I am now very seriously considering my options. In my opinion, one critical aspect in the analysis should be the likely loss(es) that will ultimately occur in any DC-AC-DC conversions that will invariably occur with a micro-inverter system. When you take this into account then a DC-DC coupling of say a SolarEdge solution is probably a winner, though I don’t discount some of the points you raised above. Anyway, with this in mind, my house is wired for 3 phase so I am unsure as to whether the SolarEdge inverter or storage interface module would provide any dynamic load sharing across all three phases or whether there is a need to have additional components to facilitate this. I am not sure if the Enphase solution has a buggery box to facilitate 3 phase load sharing/balancing either. My end solution is complicated by the fact that I wish to run in-slab heaters, which on average consume about 80-100Kw per day. I would love to run these directly from solar during the day but I recognise that even a 15Kw system (as much as my north facing roof aspects will accommodate) will not cut the mission during winter months …. though I could use the grid to build up a credit during summer months upon which to draw down at a later date. In addition, I am just now looking at EVs or PHEVs to potentially improve the potential ROI of the overall system also. The AC battery is fundamentally a bad idea. It is simply a battery with a rectifier to convert the AC to DC and inverter that will concert the battery DC to AC. It will result in at least 5% additional energy loss compared to a solaredge/tesla battery system. Enphase AC battery has zero chance of being even close to the cost of the powerwall unit on a per kilowatt basis. It also adds equipment cost and reliability issues. Tesla selected the solaredge process based on the technical and economic advantages. As installers we used enphase micros for years before switching to optimizers almost exclusively about 12-18 months ago. Over time we’ve had many micros fail causing downtime and loss of productivity for our customers and requiring time from us to go out and replace them. Not a huge issue, but definitely not ideal. On the other hand, we’ve never had one optimizer fail. This gives optimizes the win for efficiency to me. Is this consistent with other installers’ experience ? Also, Finn, in your opinion how does the solaredge SafeDC feature improve the safety of optimizers compared to micros? 1) Do you know what the failure mode of the micro failures was? 2) How recently have you had to replace one and what model version was it? Just as we thought we were close to a decision on our new string solar system, one company raised the possibility of micro-inverters, especially given that we have some shade issues on a well-treed block. You’ve said elsewhere on your blog that if the prices are close you’d opt for micros but I’m also conscious of the comments about extreme climate stress as an issue for micros. We are in SA where summer temps of 40+ are increasingly common. Your thoughts please. Personally I’m pretty happy with the reliability of good microinverters (like Enphase) even in Adelaide. I’ve had micros on my roof for 2 years and they’ve never stopped producing power, even through the heatwaves. I think Enphase are warrantied for 12 years in Australia wheras most central inverters are 5 or 10 year warranties. Good article. One caveat. In 10 years, batteries will indeed be affordable for almost anyone to go completely off grid as long as they have space for them. Utilities are fueling batteries as well as they continue to increase thier “grid” fees. Here in san diego I am already paying $45/mo just for being able to use the grid even if I use 0 electricity. In 10 years I am sure that same fee will be between $75-$100 because those executives dont want to take a pay cut so they will need to keep revenue and net high even if it destroys the business later. They dont care because they probably wont be there anyway and could liquidate their stock long before it happens. That means that micros are a bad choice even if their own battery is cheap for the simply fact that every time you convert you lose a significant amount of power. For micros you will be coughing up about 5% just for conversions. No such issue with Tigo or Solaredge although I am not a fan of solaredge because of their proprietariness. I am rooting for Tigo but they have some issues to iron out. Can a string inverter system be converted to a micro system and would that affect the feed in tariffs in Victoria even if no extra panels are being added? Also if micro’s are individual can they be added (as in more panels) without affecting the feed in tariffs? One last thing if being able to add capacity to an existing system and not lose your current feed in tariff by creating a what is essentially a new parallel system is possible (as I understand it) up to a certain kwh limit (usually <10kwh), is it possible to add a micro array as the parallel system, when you have an existing string inverter system already installed, e.g. is it possible to have a hybrid system? If possible would that be a good idea or fraught with bad karma? Adam, generally you can change your inverter without losing a high feed-in tariff, as long as the total capacity of the new inverter or inverters is not larger than the old one. So you could replace a string inverter with microinverters provided the total capacity of all the microinverters was equal to or less than that of the old string inverter. If you have an existing string inverter system and add panels using microinverters that counts as adding to the total inverter capacity and if you have a high feed-in tariff that will cause you to lose it. If you have a high feed-in tariff and want to keep it you can’t add any additional inverter capacity that is connected to the grid. But it is possible to add solar panels and inverters that aren’t connected to the grid. For example, you could use solar panels to run an off-grid pool filter or hot water system, or whatever. 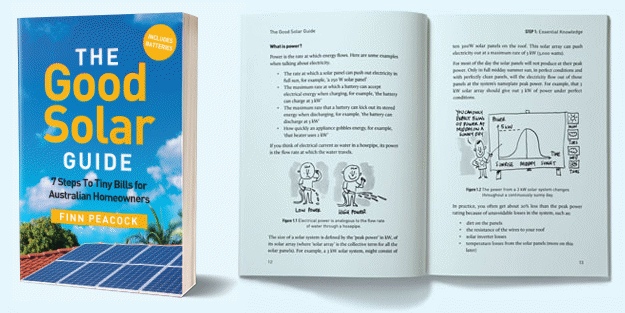 If you are not on a high feed-in tariff, or simply don’t care about losing it, then your options on how to increase your solar capacity are more open. I was wondering with the high feed in rates can I install a larger capacity system and export limit to the approved system. Therefore can use the additional non feed in power for my home and maximising the feed in to the grid. I’m sorry Allan, but any increase in inverter size will result in the loss of a high feed-in tariff. But depending on where you are it may be possible to increase the number of solar panels you have and keep it. You may be able to increase your panel capacity up to 133% of your current inverter capacity. Unfortunately, you can generally only do this if your inverter meets current standards and it is likely an inverter that is receiving a high feed-in tariff is old enough not to. I was just wondering, you say if you want the powerwall, it would tip the balance towards optimizers, because of the cheap integration. But doesn’t the powerwall come with its own built in inverter to be able to be hooked into AC systems so it can not only be re-charged by solar energy but also by off peak mains energy for load shifting purposes as well? In that case it should work perfectly well with micro inverters as well out of the box making it just as a viable option, unless there is something I am missing? Hi Adam, Ronald here. This is an older article, so it is referring to the original Powerwall which didn’t have a built in inverter. Are you sure that electrolit capacitors attached backside of a solar panel can work for almost 25 years? … Nonsense. There is no white paper (like sunpower did with their panels), that would show how much test cycles needs for micros to fail. Pretty old story in your link – 2010 installation – so it could be fair to say that their product might have improved a bit since then as they are still here and still offering a very useful warranty. The expected lifetime of an Enphase microinverter is 25 years, the expected life time of a string inverter is about 12 years if you are lucky. So factor in the replacement cost of the string inverter halfway through the life of your system and the economics for DC optimizers changes significantly. 1) For a roof with scattered shading issues, would you recommend Enphase Microinverter or SolarEdge Optimizer? Why? I am therefore confused and hence the question (1) above. 2) What is the warranty period for Tigo Optimizer, Enphase and SolarBridge Microinverters? Both Enphase microinverters and a SolarEdge inverter with optimizers will give similar results. Enphase microinverters have a warranty of 10 years in Australia and 25 years in the US. Solarbridge inverters appear to be similar. Tigo optimizers have a 25 year warranty. I have a read about this amazing Maxim Integrated technology. Just wondering whether we can fit this new chip onto a panel with 25 years guarantee (like Sunpower). We can then set and forget about the system and only need to replace the string inverter (located in the garage) after 10 years or so………..no need to worry about costly access to roof. How long is the warranty period for this Maxim chip? Maxim says that, while they haven’t been able to field test it for that long, they are confident their technology should last the life of the panels. Solar panel manufacturers, such as Jinko, give their Maxim panels the same 10 year product warranty and 25 year performance warranty as their other panels. However, Jinko has withdrawn their first generation Maxim panels for causing television reception interference and say the second generation, with this problem fixed, will be available soon. I have recently had a quote for 38 x 280w Suntech Smart DC panels. I was told that this is the second generation of Maxim panels by SunTech and they have ironed out the tv reception issue, but I am unsure whether this is a market-accepted resolution yet (the installation company is apparently the company involved in testing this second gen product in Australia (SA)). I can’t find any info on it and the quote I was given for the Suntech smart DC panels referred to a Solarquotes article (from 2016 – see https://www.solarquotes.com.au/blog/maxim-just-killed-microinverter-dc-optimiser/) saying how great they were. Given the other installer who gave me a quote said he had not installed any since 2016 and the Solarquotes optimisation article from 2018 suggests that Maxim panels are ‘out of the contest because you just cant get them in Australia’ (see under the heading ‘Which PLO should you choose?’) am I missing something? Have there been developments regarding these panels and their availability? Other manufacturers have cancelled plans to introduce panels using second generation Maxim optimization in Australia because they weren’t able to overcome the interference issues, so its reasonable to be concerned. But, looking on the bright side, the original panels did not always causes problems. It seemed to mostly be a problem where TV or other signal strength was already weak and could be remedied with a new antenna. So hopefully these new panels will be an improvement and won’t be a problem. But I would want to know what they will do if there is a problem. For example, will they replace your TV antenna with a new one? What will they do about poor radio reception if that’s an issue? We run our TV through a Foxtel satellite dish so would potential interference be different to a standard TV antenna? The pain of hubby (and eldest son) not being able to get good reception on Fox Sports would more than outweigh the cost of a system which does not have any possibility of reception interference! Also, will all installers do SolarEdge inverters and what would be the difference in cost to the 38 DC panels (quoted with a Fronius Symo 8.2-3-M inverter for just under $10k)? I thought getting some quotes would make it easier to choose, but this has meant I am comparing apples and oranges and the more I read about what has been recommended, the more confused I get. Ultimately, I think I just want safety and reliability, but not at the cost of an arm and a leg. I doubt a Foxtel dish would suffer from interference as it is very directional. But I’m not certain of this. If the roof space where you are planning to put the solar panels doesn’t suffer from a significant amount of shade through the year then there will be little benefit to using either Maxim optimized panels, other optimizers, or microinverters. So if there is no significant shade then don’t worry about getting Maxim optimized panels if you are concerned about interference. Not all installers use SolarEdge inverters but if you shop around you should be able to find some who do. You are likely to pay a premium over a Fronius inverter but the total cost will depend on the what the installer quotes which can vary. If you are concerned about safety you can get a usual solar system with a string inverter, such as a Fronius, have it put in by a quality installer and make sure to have it inspected every 5 years to be on the safe side. But if you are willing to pay more for an extra level of safety you can go with a SolarEdge system or microinveters. If you were considering a 38 panel system then one that large will be quite expensive to do with microinverters. I recommend getting a variety of quotes, looking at the prices on offer, and then deciding if you are happy to pay a premium for additional safety. Thanks Ronald, if Foxtel is unlikely to be affected by interference that’s a bonus, although one installer has asked me if I could move the dish which sounds a bit rich given there are options for this minor shade issue. Our main shade issue is from a large (think 100 yrs) Norfolk Pine out the front (east side) which would affect morning sun to some degree even with our double storey and reasonably high, primarily north facing pitched roof (we also have a west facing verandah roof). When asked about Maxim panels, the installer said they would prefer to provide the optimization as part of the panel construction, as done with the Suntech MAXIM modules, as they have one less point of failure per panel. They have apparently done plenty of SolarEdge installs in the past, and weren’t happy with the failure rate of the retro-fit SolarEdge optimizers, and with our place being a high two story job, they don’t want extra failure points to be responsible for. Is this a cop-out to try to get me to go with their SunTech system or is this a legitimate concern? It seems the more questions I ask, the more confused I get with the answers. With some morning shade am I correct that optimised panels of some nature or microinverters are my only 2 options? If a tree would be shading the panels in the morning I can see why the installer recommended a system with panel optimization. But you can install a system without optimization. In a best case scenario panel optimization will only reduce losses from shade by 25%. So if your system would produce 75% as much energy as an unshaded one, at best optimization will increase that to 81.25% which isn’t a huge improvement. In reality the increase is likely to be much less. The link Peter T provided does a good job of explaining the problems a number of installers have with SolarEdge inverters. With regard to relocating a Foxtel dish, my understanding is what Foxtel charges to do it is reasonably low and so — depending on the situation — it may be the best alternative. 1) Install the Maxim optimized panels and have a hopefully small risk there will be interference. 3) Install panels without optimization and produce slightly less solar energy but — all else equal — at a lower cost. 4) Use microinverters. For a quite small system microinverters can be reasonably priced but for a large systems they tend to get expensive. 2) Use a SolarEdge inverter and optimizers. You may have to find an installer who is still happy with SolarEdge to do this. We’ve been going through the microinverters vs optimizers thing recently. Our installer said that in harsh SA conditions, microinverters are only warrantied for/ likely to have the same life as new string inverters. Then, either will need replacing. For a string inverter, easy. For microinverters, it means taking every panel off the roof and dealing with each one individually. Guess time will tell if he’s right! I am just wondering with the passage of time if anyone can shed any further light on this. I am looking at getting solar and was planning on getting micro-inverters but when i just spoke with the installer he was suggesting getting Solar Edge panels with Optimizer to future proof the panels as they would be easier to install batteries on down the track. I have no interest in battery storage at the moment but in time when the technology improves and the cost reduces i am sure it would be something to consider. He also told me that the optimizers will basically do the same job as the micros and you can monitor each panel and run a Solar Edge HD Wave inverter…….this is all so complicated. If you want to get batteries in the future, AC coupling will allow you to install them no matter what type of solar inverter you have. I don’t recommend spending money now to prepare for getting batteries in the future, as battery storage is a rapidly changing field and you risk your current investment going to waste. That said, both microinverters and SolarEdge’s DC optimisers are effective ways of getting the most out of solar panels. They will both cost more than a simple string inverter though. A cheaper option may be to use panel string optimized solar panels, but they may be hard to find at the moment as Jinko has withdrawn their first generation Maxim optimized panels and their second generation probably won’t be available until next year. If your roof is unshaded, or has no significant amount of shade through the bulk of the day, then you will only see a small improvement from using microinverters or optimizers or panel string optimized panels. If your roof does suffer from significant shade, then you’ll find it more useful. Finn’s article is 2+ years old – was wondering if technology has marched in any one direction and that maybe DC optimizers may have moved into pole position. With the exception of the Enphase dealer, every other salesperson has tried to talk me out of micro inverters with all kinds of concocted horror stories. I like that with micros we are only dealing with 240VAC. If cost were not an issue, do micros still have the edge today? If cost were no issue I would say micros have the edge because they eliminate the need for DC cabling on the roof which basically eliminates the chance of a DC arc occurring. This is only an extremely small danger in any system that meets Australian standards, but is an advantage. Fault detection built into DC optimizers may provide the same level of protection. Normally eliminating something altogether is the best way to avoid problems, but it could be effectively the same. I’d have to look into that. But where microinverters win, in my opinion, is system resilience. This is because when a string inverter fails the whole system will stop working, but with microinverters if one fails the rest keep functioning. Some people look at this the other way and say that with microinverters there’s more inverters that can fail, so I guess it depends on your personal outlook. But if price is an issue, then panels with panel string optimization have an edge. They don’t eliminate DC cabling or allow monitoring of individual panels, but have a cost advantage. I understand Solaredge optimizers provide panel-level monitoring? I was speaking with an installer about DC optimizers vs microinverters. Their recommendation was optimizers for the high output (335W) panels we want to install. Current Enphase microinverters have a maximum input rating of 270W and so presumably the extra 65W the panels can produce at maximum output would be wasted. I did read somewhere that the microinverters may work at higher input wattages, but it wasn’t clear if this would affect the longevity and reliability of the units. Generally speaking using optimizers will cost you less, especially if the solar system is large or if they are only placed on panels that suffer from shading. But some people like that microinverter systems are more robust as there is no single point of failure. If one microinverter fails the others can keep working. Generally it makes economic sense to oversize your panel capacity in relation to your inverter capacity whether you are using optimizers or microinverters. Or if you are using neither. While it’s possible that using lower wattage panels would extend the live of microinverters, since you’d be paying more per watt per watt of solar panel capacity it’s only likely to make the economics worse. just to support what Ronald Brakels wrote, The rated output means that if you have the sun pointed directly orthogonal to your panels’ surface, and the atmosphere is totally clear, the sun is high enough that it is passing through only a small cross section of atmosphere, and the ambient temperatures are relatively low, then your panels could produce at, or close to, their max ratings. Any other conditions and you will see less than rated output. So the recommendation (whether using optimizers or micro inverters) is to clip the production curve by over sizing the panels relative to the microinverters or optimizers. I have 260 watt panels paired with 225 watt microinverters (15% over size) and my system is one of the highest producing systems (in terms of total kWh per watt of capacity installed) – it routinely ranks in the top 4% in terms of efficiency on PV Output’s website. For a 260 watt microinverter a similar over sizing would suggest a 300 watt panel would work well. The reason clipping makes sense is that on days that the output is clipped one produces considerably more electricity during the shoulder periods. Also over time panels lose capacity and their is less clipping. We are just about to get our panels installed and I noticed that we are getting a small amount of shade (maybe 2-3 panels only in 24) for a few hours in the middle of the day, from a nearby tree. Do I need to raise this with our installer or just wait to see how much our output is effected and get some optimizers fitted later? Can I get them fitted to only the few panels that are being shaded and not the rest? I’d certainly mention the shading to the installer. Just a small amount of shade can greatly reduce the output of a system with a normal string inverter and if its happening in the middle of the day it will take a big chunk out of your system’s output. Generally, it is going to be a lot cheaper to get optimizers fitted from the start then have them put on later. Optimizers can be attached to just the panels that will be shaded but where the shade falls will change with the seasons so that will need to be accounted for. Putting panels on a different part of the roof is also an option. While that may reduce the system’s output it may reduce it by less than shade will. If it’s your own tree you could just trim it. In Queensland neighbors can be required to trim or remove trees or bushes over 1.5m that shade your property but I believe in other states your right to sunlight isn’t as strong. I will get in touch with them tomorrow. We don’t have any other roof space to use, but looks like this will be a mid winter problem only. Unfortunately we don’t seem to have such strong laws as in Q, but I will check. I have one minor thing to mention about the Robustness section in the article. I experienced firsthand recently that a single microinverter can take down an entire string (AC branch circuit), which was mentioned as a problem only associated with optimizers. If a microinverter has an internal fault that causes the AC branch circuit breaker to trip, the whole string goes down and the fault can be very difficult to pinpoint. In fact, in this case, I thought I was looking for a wiring fault in the trunk cable or home run wiring, when in fact it was a microinverter’s internal failure. If I didn’t hear the pop and see the smoke, I would have wasted a significant amount of time searching for a wiring fault. Granted, this kind of fault is arguably “safer” than a DC fault, but in terms of robustness, this is something to consider or at least be aware of. Most microinverter faults don’t result in this phenomenon where a string goes down, but it can happen. That said, I still prefer the microinverter system architecture due to the risk of string inverter failure (added potential point of failure) and the mess and cost that is going to cause in terms of replacement in 10, 15, or 20 years. It’s hard enough now finding someone to competently change out or upgrade a transformer-based inverter from 5-10 years ago. Love the website and this article in particular. Really informative to our solar research. I’m getting quotes at the moment in VIC on a solar system split across my north and west facing roofs. -Overall system size we are likely to go with is 4.8kW, but we have the space to make this up to 6.6kW if we choose to invest more. Considering our situation is it worth considering the capital cost of optimisers for potential, minor shading issues in the AM? Only a very small percentage of a north facing solar system’s output is generated in the first couple of hours after sunrise and optimisers will reduce losses from shade but not eliminate them. So if only your north facing panels are affected by shade early in the morning it may not make economic sense to install optimisers on those that will be affected as they may boost total output by less than 1%. Let’s say your system produces 8,000 kilowatt-hours a year and spending $400 putting optimisers on the shaded panels will cost you $400 and increase total output by 2%. That will give you an extra 160 kilowatt-hours a year. If that is worth 20 cents a kilowatt-hour it comes to $32. That’s not a bad return on $400 but if you have the option of spending that $400 to get a larger system to begin with that will probably be a better use of the money. Thanks for the advice Ronald, much appreciated. Helped me decide that putting optimisers across all panels wasnt worth the capital cost and instead upsized the system a little. I’ve ended up negotiating with the installer who offered to throw in a few optimisers onto the panels likely to receive minor shading issues. So all in all I think it might be a good outcome. I have a similar layout with 4.8 kW of panels scattered over North (1.8) and West (3.0) aspects, and also split between an upper and lower storey roof. Shading isn’t an issue but I wonder what difference upper/lower splits might have on performance? The lower storey roof does end up in shade very late in the day almost at sunset but the upper follows about 30 minutes later anyway. Having panels that are connected to the same Multiple Power Point Tracker (MPPT) on higher and lower roofs shouldn’t affect performance provided they are at the same angle and don’t suffer from shading. As your lower panels are shaded before sunset, unless they have optimizers attached, that will also drag down the performance of the unshaded panels attached to the same MPPT. The good news is, if it is half an hour before sunset you system’s output will be low by then anyway, so you won’t be losing out on much. The bad news is most households self consumption of solar electricity it usually high at this time. You can check what effect shade has on your system by checking the inverter output before and after they are shaded. I would like to get some advice please regarding panel setup and whether a solaredge optimiser will likely increase the yield compared to fronius. I plan to put on a 6.6kW system on my roof. Roughly half half split between West and NorthWest roofs. The west roof will be on tilt frames as its flat. The NW roof has roughly a 15 degree pitch. As the main house has a flat corrugated roof, birds tend to walk and maybe poo around on the roof as I could hear them from my house. In this instance, is it better to put solaredge on each panel (due to bird poo droppings and hence potential shading?) Or fronius is fine? Solaredge allows me to monitor each panel individually so if there is poo, I would be able to tell due to lower solar generation? I do not have any other shading from trees or neighbour’s house. Only concern is with the bird poo. If you look at your roof and you can see bird droppings there now it indicates they are also likely to build up on your solar panels. If there are no droppings then the bird poo problem may not be too bad or it might have rained recently. 1) Just use the Fronius inverter and solar panels and take no precautions. Presumably you will lose some output due to bird poo but you will save money on the installation and this may make it worthwhile. 3) Use microinverters. These allow each panel to operate independently, but tend to be expensive. Especially for a 6.6 kilowatt system. 4) Use SolarEdge with panel level monitoring, or you can look for a different system that also provides it, although I can’t think of one off the top of my head. This has the advantage of letting you know if one panel is performing poorly. But decide if you need panel level monitoring. If you see one panel has probably been pooed on will you make the effort to get it cleaned or will you just wait for it to rain? If it’s the latter then knowing that a particular panel has been pooed on isn’t that useful. Number one is the cheapest option. (Between vet bills and food cats can be expensive.) The lower cost means most people would probably consider it cost effective, but it all depends on how bad the poo problem is and how much you are willing to spend to get the most power out of your system. If money is no limit then Sunpower X or E series panels with optimizers are probably the most poo resistant panels of all. Is there any difference with buying a panel with optimiser built in vs attaching one later? Any particular brands do this well ? You can just go with whatever is most cost effective. There should be no difference in performance though it’s possible to make a good argument that factory installed optimizers should be more reliable as the factory can perfect the process and potentially completely automate it to eliminate direct human error. But really it’s the warranties and how reliable the installer is that is important for a household. The trend is for more optimizers to be factory installed but after factory installations won’t disappear any time soon as people may want just one or two panels to have optimizers to handle a shade issue.